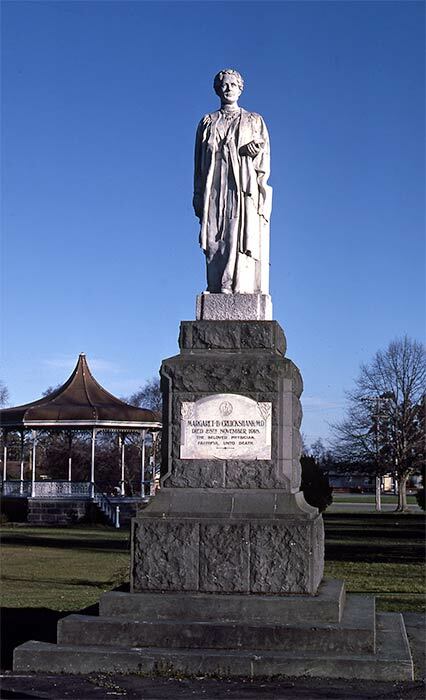 This fine memorial to Margaret Cruickshank is one of New Zealand's few memorials to a woman other than Queen Victoria. It honoured Waimate's local doctor, who died in the influenza epidemic of 1918. Cruickshank was the second woman to complete a course at Otago Medical School, and moved to Waimate as a doctor in 1897. During the epidemic she worked tirelessly before falling victim to the disease herself. The marble memorial was sculpted by William Trethewey, who had prepared a plaster cast and displayed it in a shop window so locals could comment on the accuracy of the likeness. At the base of the memorial are the words: 'The Beloved Physician/Faithful unto Death'. For many years a bowl of fresh flowers was also placed at the base of the monument.